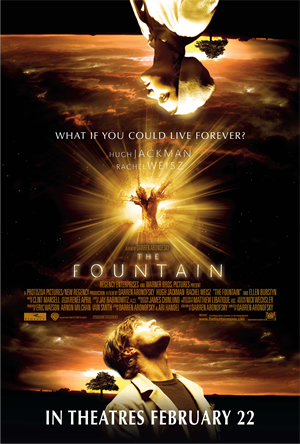 Publicity Stills of "The Fountain"
The Fountain is an odyssey about one man’s thousand-year struggle to save the woman he loves. His epic journey begins in 16th century Spain, where conquistador Tomas Creo commences his search for the Tree of Life, the legendary entity believed to grant eternal life to those who drink of its sap. As modern-day scientist Tommy Creo, he desperately struggles to find a cure for the cancer that is killing his beloved wife Isabel. Traveling through deep space as a 26th century astronaut, Tom begins to grasp the mysteries of life that have consumed him for more than a century. Other than my unfortunate webmaster who has to upload this article, I do not think this review will be accessed by many readers. This is probably due to the fact that this latest film by Darren Aronofsky has not gotten much publicity or rave comments by film fans for that matter. To set the context, this reviewer is a fan of Aronofsky’s last movie Requiem For A Dream (2000). Hence, there may be certain parts of this review that may sound subjective. But as Aronofsky would probably tell you, his works were never meant to be objective. Like whether you agree with this reviewer or not, Aronofsky wouldn’t really care whether you buy the message behind this third feature film written and directed by the young filmmaker. The out-of-this-world story spans over three different eras, telling three different sets of love stories connected in some zen way that not everyone will be able to subscribe to. Although this is a love story, you will definitely not be bringing home much lovey-dovey feelings after stepping out of the theatre. Instead, the devastatingly beautiful images will be haunting your mind while you ponder about the fragility of human existence in this universe. That is one intellectually deep theme to explore in a movie, if you ask me. I take my hats off to Aronofsky, who has the audacity to explore these potentially pompous messages with his commercially-packaged “sci-fi romance”. Putting a finger to this film’s genre is almost impossible because of how the story is told. The unique method of putting the three segments together requires a genius’ mind, and Aronofsky has actually pulled it off quite well, in my opinion at least. Thanks to Hugh Jackman and Rachel Weisz, the two protagonists have engaged feelings of desperation and loss in me. Their vulnerably emotional performance has successfully made me awe-struck by the end of the movie’s 97 minutes. Thanks to the intensely stunning cinematography by Matthew Libatique (Everything is Illuminated, Inside Man) and a strongly impacted soundtrack score by Clint Mansell (Requiem For A Dream, Sahara) and Scottish rock band Mogwai, my viewing experience was greatly enhanced by the involvement of the high production values. There are so many things to look out for in this film, from love and life to religion and philosophy - one viewing is definitely not enough. That is, if you haven’t been turned off by its impudent approach of telling a story. For a movie this bold and visually daring, it definitely deserves to be recommended. If there is any rationality left in this reviewer, it has prevented him to give a near-perfect rating for this movie. Now, that is kind of tragic in this safe world we choose to live in.